Unity U-8547 LED Clear Replacement Spot Lamp 6 inch diameter PAR 46 LED Clear Spot Lamp, 30 watts, 215,000 candlepower, 50,000 hours lamp life, tightly controlled spot beam. The lamp has a hard-coated, polycarbonate, sealed lens and an anodized aluminum die cast reflector. Screw terminal design fits model S6 and S04 rooflights, spotlights and decklights. I have recently ordered the 6" LED clear spot lamp as a replacement to my fitted spot lamp head, and I must say its by far the best thing I have done. Awesome product, Super Fast Shipping. Recently swapped out the halogen lamp for the LED one, and it was well worth the money. I can actually see what I am trying to look at from my vehicle, and house numbers and street names are much easier to make out due to the whiter light. I wish I had done this years ago, and now I will try to convince my agency to swap all the lights out. The product is great. The service was good and the delivery was on time. Q: Will this lamp be a direct replacement for 6'' spotlights installed by Ford with the bullet style connector? Q: What is the beam spread? How far does the beam illuminate? I am hoping to replace the standard 100 watt PAR46 in my 6" Unity spotllight. A: U-8547 has a tight beam pattern with a 4 degree beam spread. Illumination is tricky as it depends on several factors and can be measured a couple ways. We measure our lights as the distance at which there would still be enough light to read a book as defined as .5 candlepower. That distance is about 650 ft away from the light. U-8547 will replace U-7682 halogen lamp in model S04 spotlight. We also have new option of X-LED replacement head. X-LED spotlights use a specially designed head made to be LED, instead of just LED fitting in existing housing. Your lights halogen head can be removed and switched with this LED head. X-LED spotlights have a beam similar to the halogen with a hot center with extra glow. They have a 9 degree SAE approved spot beam. With a distance of about 670 ft. Replacement heads are 8848 for chrome or 8848-0002 for black. It can be used on any current model of spotlight. Q: What is the Lumen output? Q: How long is it warrantied? A: U-8547 Lamp has a 5 year warranty. Q: What is the amp draw on this light? Q: We are trying to change our S6 roof spotlights to LED. Would this replace the original light? A: Yes it will. It works in model S6 and S04 housings. Q: Does the U-8547 LED Kit include the 7735 & 7852-1 or 2028 & 7852 Wires, and 5548 (3) or 7729 (3) Gaskets? Q: Does this lighthead have screw terminals? A: Yes two screw terminals located on the back of the unit used to connect hot and ground connections. Q: Will this lamp work with a 24 volt supply? Do you sell a 5AG series light with LED as the original lamp? A: This lamp is designed to function on 12 volts and will not work with 24 volts.. We have heard of customers with 24 volt systems being able to run 12 volt lines, but we do not know any details on how to do that. We do not have any LEDs for the 5AG series lights, but we do have 3 different LED options for the AG series that can be combined with any of the 5 different bracket options. 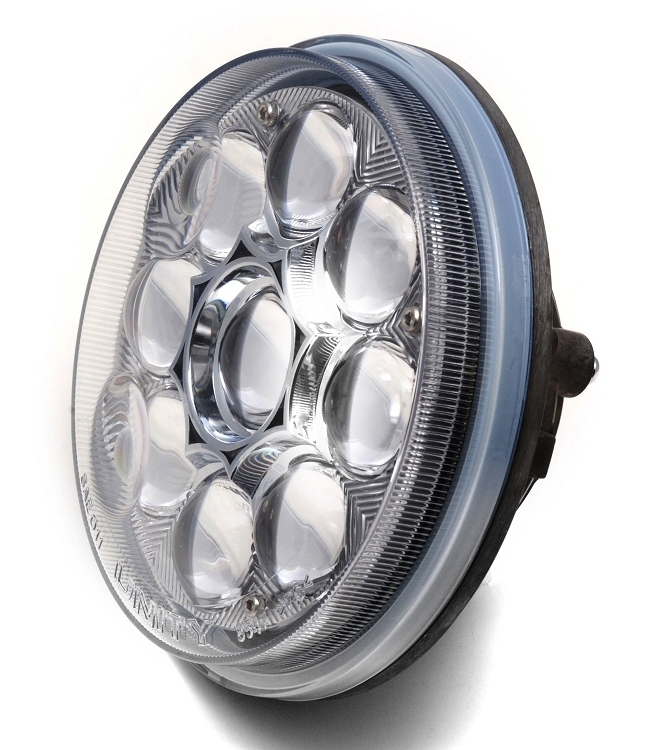 Q: Will these LED U-8547 spot lamps work in your 300 Series 6" Off-Road Lights (Pair) (F1) ? Thank you. A: Yes, it will with some minor modification. We ship the 300 series lights with a ground strap attached to the bulb terminal and, as a result of the geometry of the U-8547, the ground strap cannot be used. A ground wire would need to be added if you are upgrading an existing unit.